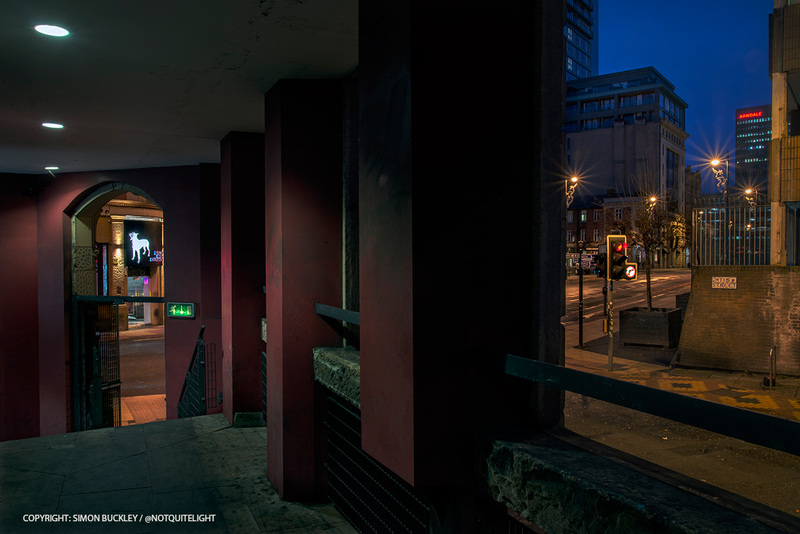 NOT QUITE LIGHT – Pictures of Manchester city centre's northern edge, taken in the half light of dawn. 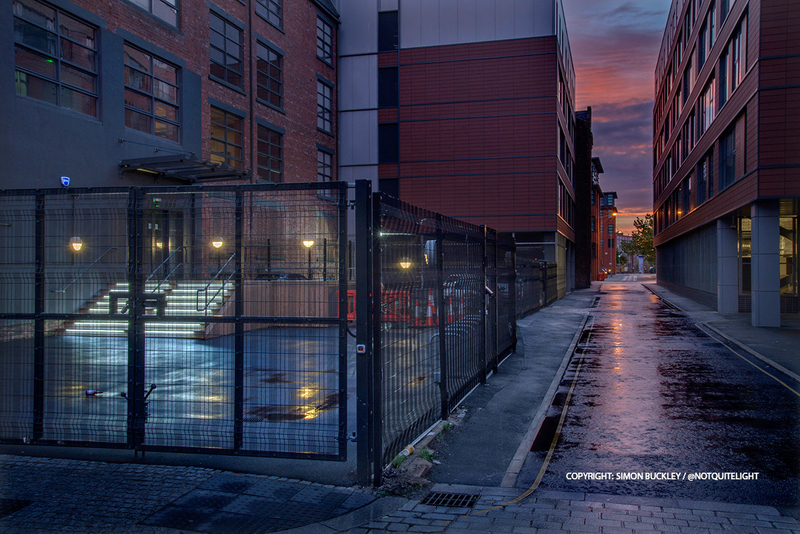 Pictures of Manchester city centre's northern edge, taken in the half light of dawn. When my kids were little I used to love building them sandcastles. Hours would be spent constructing walls, towers and moats. I even used to dig channels to aid the sea in its inevitable destruction of something I’d been proud to have built. And then tomorrow, the beach would again be the same, but changed, as new fathers elbowed their children out of the way during their quest to achieve as much as they could before the ocean took its toll. And in the same way do cities change. Each generation arrives with its vision of how they want the patch of land that they live in to be, and they do their utmost to deliver this vision before they too are taken by the ceaseless tide. And in the months since I started Not Quite Light I’ve watched as buildings rise and fall, and new plans are begun or completed. In the time that I’ve been wandering at dawn, many of the streets have been closed off like a murder scene. Thick tarpaulin has covered the deeds being done, and all I’ve had to go on is gossip and hope, and quickly my photographs have become a testament to that which existed, and witness to what has been done in its name. The area around the CIS tower has been under a constant state of flux. People have gone to work to the sound of clanks and bangs as this area of the city is transformed into place deemed worthy of its Science Fictional mantle, NOMA. Sadler’s Yard is the latest piece of transformation to be revealed. It’s still soundtracked by the clunks and clangs of more buildings being redefined, but it’s here and part of Manchester. The committee of architectural styles that surround the square reminded me of both the beauty and schizophrenic nature of our city’s architecture. Victorian, Art Deco, Modernist, they all gaze down upon a square named after a pastry chef from Oxford, who was Britain’s first aeronaut. The boards cladding the lower parts of the walls tell you this. I watched the awkward, wooden Christmas tree change colour like a disaffected chameleon as workers at the far end of the square raised a crane. A man arrived to begin picking litter from the new hedge funded by the Co-op and Hermes Real Estate. A security guard, who had been eyeing me from his office since I set down my tripod, plucked up the courage to ask what I was doing. I asked him his name. “I’m Mr Anderson.” he said. “Well then, I’m Mr Buckley”. He smiled, and replied “You can never be too careful in the current climate”. The rain was bouncing off my hood, the tippy-tap noise being my only company in this small side street tucked away behind Ducie House. I saw no-one and no-one saw me. If I’d been more of an animal than my modern, city self I’d have gone to shelter on higher ground. The lemming leaves lay dead on the ground, except for two which remained like young lovers looking into the sunset on the last night of their holiday. I found myself staring at the leaves. They seemed so defiant. The street, with its odd name, felt ancient and I wondered if others had stood here and gazed upwards, considering the passing seasons. I wandered down to Ducie Street whilst I coldly waited for the dawn to begin and, looking towards Paradise Walk, I began to talk to myself. Someone passed by, stooped against the pounding drops until they heard my aimless chatter, when they looked up, alarmed. Feeling foolish I went my back to my camera, hidden under a black umbrella. 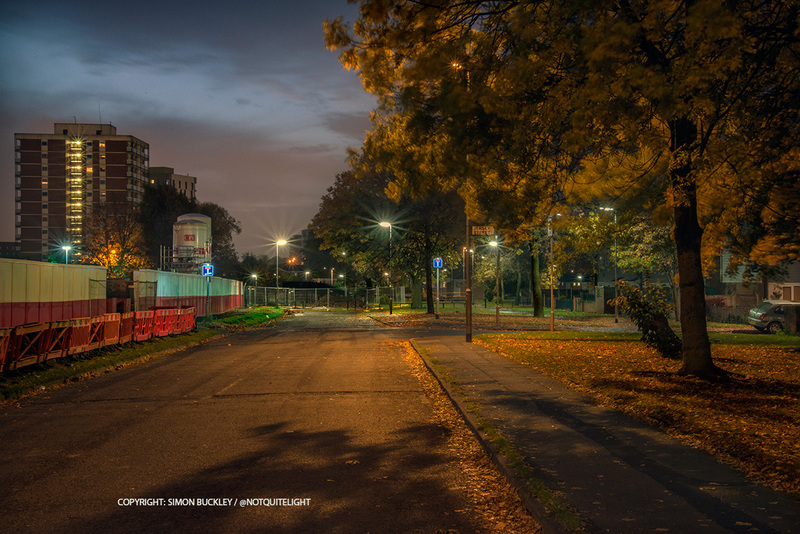 Lights were turned on in the modern apartments beyond the Victorian walls and the sky gave up its darkness. I broadcast my shoot on Periscope, perhaps because I wanted the company. Someone from America said that they thought the leaves spoiled the picture. Following the awful events in Paris a few days previously, the world had become cloaked in the Tricolour. It was before my eyes wherever I turned. At the previous night’s concert, or in Blackpool at the weekend, and my social media timeline appeared to be entirely decorated in red, white and blue. I seemed to notice it even when it wasn’t there. I was staring at the sandwich shop across from me, wondering if anyone knew that the French flag had accidentally been daubed onto the rain bespattered streets, when a warring couple came down the street. The male had a bony, cropped head, open to the elements. From his gaunt face were launched words of spiteful anger. His girlfriend was shrunken inside a large quilted coat, and tears ran down her cheeks as easily as the raindrops on the dark walls next to her. They crossed over the road and she crouched into a doorway near the sandwich shop. I decided not to intervene, as I’d little understanding of what the dispute was about, and it wasn’t the first time I’d seen them in this state. I simply watched for a while, to make sure it didn’t escalate. Around the corner on Dale Street I set up again, at the far end of a parking space. A car sped into the spot and pulled up just short of my tripod, the driver apparently irritated by me. She and her well spoken daughter emerged, ignored me and, from what I heard, went off to buy hot chocolates. Around ten minutes later, back on Newton Street I saw the arguing couple marching towards Ancoats, now apparently friends again. The mother and child were scampering along behind, calling something that I couldn’t work out. And then they came over to me. I could see now that they were Asian. The woman had her nose pierced with a beautiful stud. I directed her to Mustard Tree on Oldham Road. “You know, if you saw it happening, why didn’t you act?” she asked me. “Well, I’ve seen them arguing before whilst I’ve been out” I said. They both nodded politely and turned away. It wasn’t really enough. The bricked railway arches to my left were wet and black pudding blue in the cold. Other darkened figures, like charred sparklers, made their ghostly way past me towards the city centre. Car headllamps picked them out as surely as watchtower searchlights as they shifted past the old Charter Street Ragged School. As the dawn melds with rush hour, there’s no longer the silence of night in which our Confectionary daredevil seeks his inamorata. The drone of engines now fills the half-lit air. I was house sitting for a friend in the south of the city, and he’d kindly lent me his car to use whilst he was away. It’s a lovely car. Big, white as an American’s teeth and full of fancy features that somewhat confuse me. I felt like a pimp as I parked it down a side road just off Cheetham Hill Road. I’d seen the picture I wanted to take a few days beforehand. 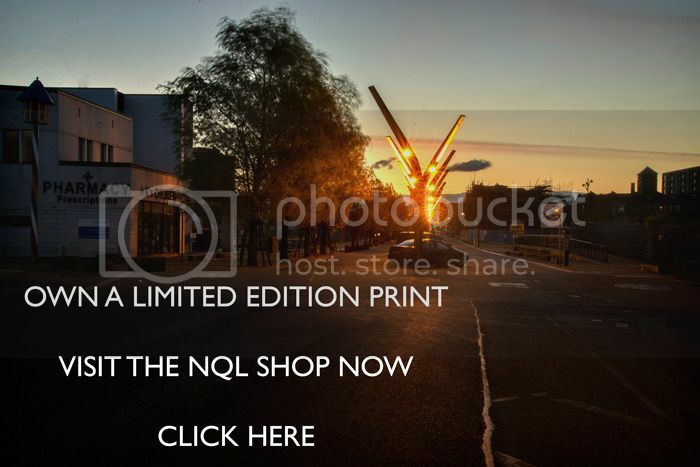 It was from a garage forecourt towards the high rise estate that calls itself the Green Quarter, which I’d recently described as architecturally grey and bullying. I stood and waited for dawn to begin. Lights in the apartments started to come on as people got up to go to work, and I forced myself to not stare into the private lives casually shared with the streets below. Across the road a car dealership was offering half price fireworks, and a man waited at a bus stop, staring at his feet as if unsure as to what they were for. I took my photograph of the jet wash machine, set against the square building blocks, and the design on its front reminded me of the kind of thing Pixar would turn into a loveable robot. I went into the shop to thank the owner, Mike, and asked him if he was on the internet so that I could show him the image I’d made. He shook his head. Outside a taxi had occupied the space where I’d just been, and the driver was vigorously cleaning his vehicle. The street lights went off and an odd pink light, like we were on Venus, engulfed us for a few seconds before a rainbow appeared over the tower at Strangeways. Is the sense of change greater with Autumn than with Spring? As the year ends, the dramatic death of the leaves and the darkened days are perhaps linked more to a fear of the unknown than the hope and anticipation that arrives with May blossom and longer evenings. I set up my camera at the top end of Jersey Street. The city centre was beyond view here, although it’s almost close enough to walk, and I could imagine that this was an area that was once fields, separate from Manchester, despite the word “Ancoats” glowing neon yellow in the dark on the side of a newly refurbished block of flats just behind me. Plenty of lights were on in the houses and apartments, although it was only just six o’clock. This was perhaps an area of routine and long hours at work. A man slipped out from his house, no more than a shadow, and got into his car. Someone else smoked a cigarette and pulled up the collar of his jacket, as if being directed in a film, before mounting a bike and setting off towards the main road. It was peaceful here. The trees moved gently, sturdy and sure in their surroundings. The sky was bursting with fresh colour as the dawn broke. Across the road, a new housing estate was being built. Soon Jersey Street would be full of cars and fresh residents bringing their new ways to an old area. After I’d taken my picture I lingered, as if this might be the last time I’d see this area as it was. When I tweeted an iPhone picture after this shoot I wrote “I didn’t end up where I thought I would”. Sometimes I set off with a clear idea in my head of where I want to be, perhaps having already been there previously, but sometimes things don’t appear as I think they will. Streets and views that look inviting in the day can simply not be as I want them to be in the half light of dawn. And conversely, something that presents as drab in daylight can come alive with colour as night clings to the walls and pavements. I’d remembered walking along Church Street, and noticing the bizarre layers of architectural styles that could be seen back towards the Arndale. And there was the famous Black Dog Ballroom, often the scene of last men standing as they’re finally forced home at 4am. So I’d assumed it would be an easy picture to take. However, in the transition from dark to light, the scene in front of me left me feeling disappointed. Instinct took me up the steps into the Smithfield Buildings, where the colonnades are more Eastern Bloc than Renaissance. A pool of light held my eye, just as the scent of a sleeping human reached my nostrils. Below me, on the street, a Chinese couple were scooping noodles into their hungry mouths before they set off towards Piccadilly, pulling suitcases behind them. Suddenly a man appeared from a shadowed corner, humble in his stance, and he asked me what I was photographing, clearly nervous that it had been him and his homeless mate. I assured him that I hadn’t included him in my composition, and offered to show him my picture, an invitation which he declined. A member of staff arrived to open up the cafe just along from me, and she tried to wake the guy still sleeping. Her tone reminded me of the one used by care staff towards elderly residents. David, the one that had asked me what I was doing, arrived with breakfast from Greggs. His friend, now awake, changed his trousers as discreetly as he could. “Been tough since I got back from Afghanistan” he said, as if I’d asked. As the dark receded more people were pacing along the streets, pulling small cases behind them. Everyone seemed to be on the move, and on the way to somewhere they didn’t really belong. Today the clocks were turned back. Rain lingered like a truculent teenager, smearing the cobbled streets of Ancoats with a Brylcreem sheen. The area is a work in progress. Old buildings, like patients screened off in a hospital ward, are surrounded by scaffolding, as the heart of the world’s first industrial city is given a new life by Manchester’s pacemakers. Original brickwork and Victorian grandeur have been retained where possible, causing streets which until recently were thoroughfares to be feared, to maintain their essential personality without the latent threat of being mugged. Once the centre of invention it has now become an area of re-invention, with its shiny new facades and dinky lighting. As I walked I became aware that I was struggling to see a photograph. A pool of light and a refurbished street may offer little more than a visual canape when, actually, it’s a roast dinner that is needed. Only when the clouds cleared, and a sun bled sky brought warm colour to walls and windows, could I finally find pictures that I wanted to see. I was a still a boy when I first saw Strangeways prison. My mother drove past it, and the strange tower, rising up from amongst the dense walls, haunted me during that night’s sleep. Was this the future of men? Since then it’s inescapable presence, poking into the Manchester sky, has fascinated me. I’ve decided that Strangeways and Empire Street should form one of the boundaries for my project, and that the best place to get a proper look at the tower, and the world that surrounded it, was from Shelbourne Street. Here the hidden lives of guilty men are framed by the frivolities of ladies fashion, providing yet another one of those schizophrenic moments so often apparent in this city. 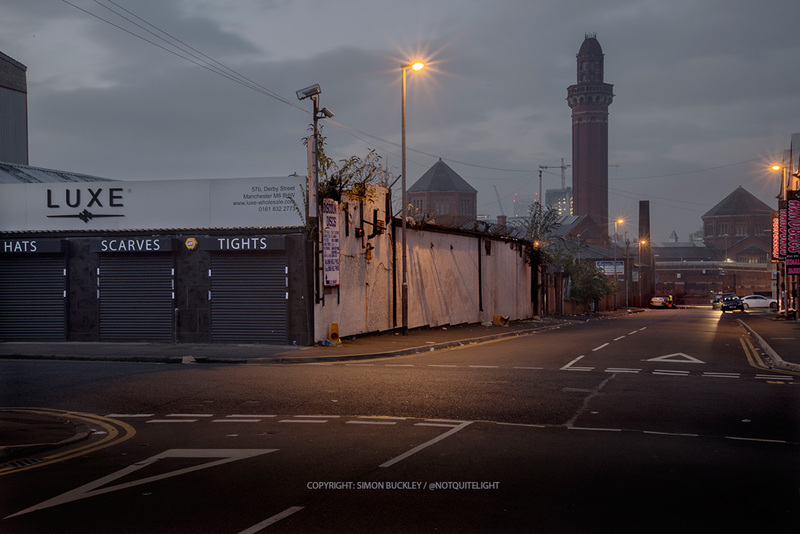 Strangeways stood proud in the early dawn, against a slight mist that softened the distant competing towers of Beetham and the Premier Inn. Two prostitutes, their arms folded, huddled together in the chill air, half heartedly imploring passing cars to stop. I’d arrived at the location in a rush, trying to redeem the mistake of the previous day, when I’d not seen the picture that I really wanted. I fumbled and managed just 2 frames before the lights popped off. The tension was gone and a simple, grey light surrounded the men and women walking briskly to their work. I was done, and set off for home.